Get CLOSE to the Animals at the "Zoo-in-the-Woods!" 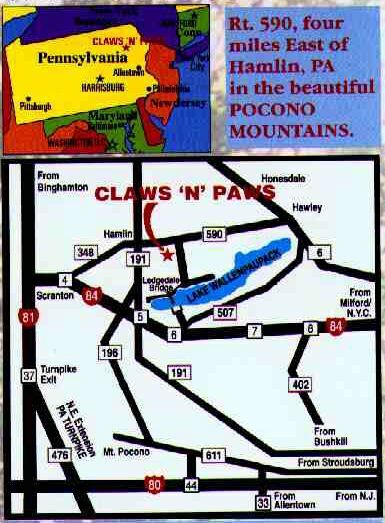 We are on Rt 590, 4 miles E.of Hamlin, PA.
From Stroudsburg, Mt Pocono Area: Rt 191 or 196 N. to light in Hamlin. Turn right on 590; go four miles to sign on right. From I-84 Westbound: Get off at Exit 20. Go N on 507 for just one half mile. Go left on Ledgedale Rd. and follow signs to Park (about 5 miles). From George Washington Bridge: I-80 West to Exit 298 in PA.
Take 611 N. to 196 N. to HAMLIN. Then 590 E. for 4 miles to sign on right. From Scranton, Wilkes Barre, and Point South along I-81: Take I-81 N. to I-84 E. to Exit 8. Then 348 E. to 590 E. and go five more miles to sign on right. From Allentown: Rt 33 N. to I-80 West to Exit 298. Then 611 N to 196 N. to HAMLIN. Take 590 E. for 4 miles to sign on right. From Philadelphia & Vicinity: Take 476 N. (northeast extension of PA turnpike) to Exit 115. Take I-81 N. and follow directions above from Scranton. © by Magic USA. Except for reviews, no part of any of this document may be reproduced in any form, without written permission by the authors. The graphics have been retouched, computer enhanced and resized by the authors.